Something Epic Happens – THE VOICE! A special tribute was given during “The Voice” show opening in dedication in memory to the children who lost their lives at the Connecticut shooting. Past ‘Voice contestants came back to sing “Hallelujah” song in the child victims’ honor. The start of “The Voice” tonight featured the coaches singing the praises of their singers left in the NBC vocal competition. Blake stated, “Terry is our powerhouse vocalist left in the competition.” His other singer Cassadee Pope said, “I hope it’s worth leaving my band for.” The competition started with sixty-four artists, and this season’s talent has been said to be better than ever. He sang a medley of “Great Balls of Fire” by Jerry Lee Lewis and “Let Me Stand Next to Your Fire”. 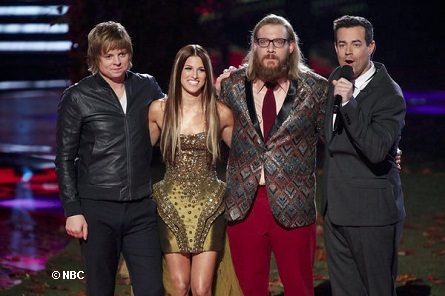 (L-R) Terry McDermott, Cassadee Pope, Nicholas David, and host Carson Daly. Cee Lo was the only coach that turned around for Nicholas. Adam – “So shinny (referencing her silver sequined dress), the coolest thing I’ve noticed about you – you’ve developed so much . You’re really shinny, You’re awesome. Terry McDermott said that his father’s love for classic rock influenced him and that made him want to make a living at it. Blake said Terry’s a guy that I actually look up to and have a lot of respect for. Terry sang “Broken Wings” is his favorite for his second song. 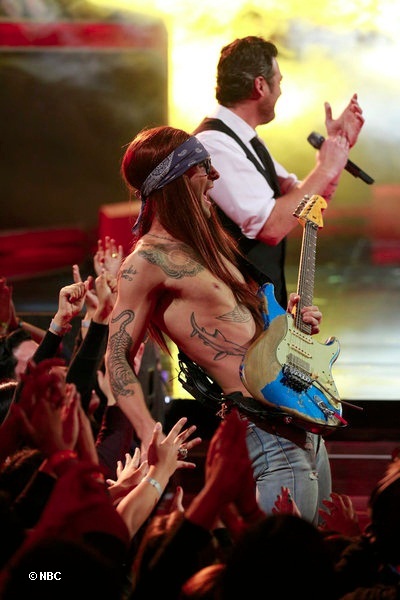 Adam Levine takes off his shirt to perform tonight with Blake Shelton. 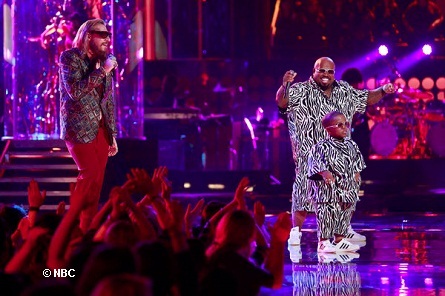 Nicholas David and Cee Lo Green sang a duet of “Play That Funky Music”. 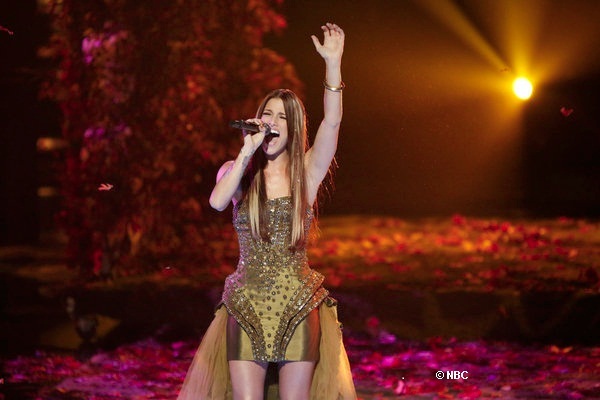 Cassadee sang “Pride” for the show’s final performance of the night. All the coaches turned around for Cassadee during the blind auditions. Blake said he felt that he won at that moment when Cassadee chose him as her coach. “I wasn’t expecting the tidal wave of the number one spot on iTunes,” Blake said. 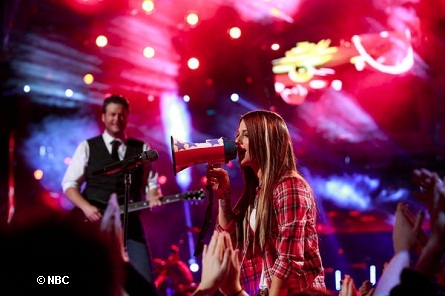 Cassadee has her Dad back in her life because of being on “The Voice”. She said Blake has given her the tools to win “The Voice”. 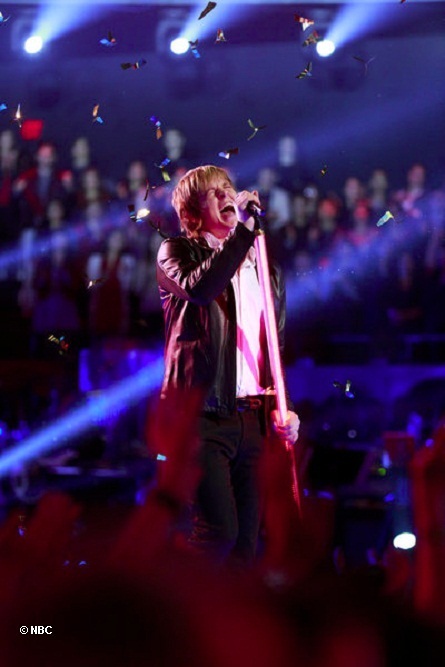 Watch THE VOICE Season Three’s Final Performances Aired Monday, December 17, 2012 ENJOY!